OTTAWA—Former Liberal MP and justice minister Irwin Cotler is pleased to finally see passed into law legislation that he pioneered as a private member’s bill back when he was a parliamentarian. 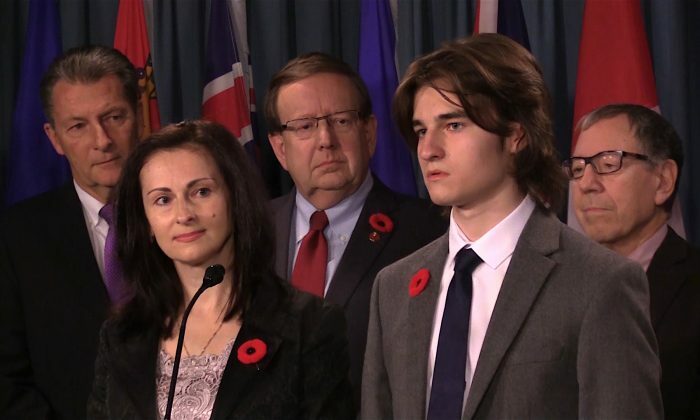 Cotler was among the dignitaries who welcomed Sergei Magnitsky’s widow and son to Ottawa on Nov. 1 to mark the passing of the legislation two weeks ago. The act is named after Magnitsky, a Russian lawyer who uncovered the largest tax fraud in his country’s history and subsequently died as a result of torture in 2009 while detained in Moscow. Under the legislation, foreign individuals responsible for gross human rights violations similar to those that occurred in Magnitsky’s case can be sanctioned. Sanctions could include barring targeted individuals from entering Canada, engaging in financial transactions in Canada, or engaging in financial transactions with Canadians outside of Canada. Other jurisdictions, including the United States, the U.K., and Estonia have also enacted their versions of a Global Magnitsky Act. “We are very thankful that this law carries the name of Sergei Magnitsky, and he is not forgotten by the people,” Magnitsky’s widow, Natalia, said in Russian at a press conference, translated by their 16-year-old son, Nikita. 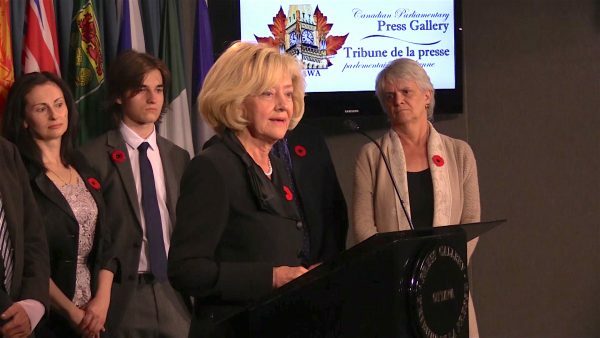 Senator Raynell Andreychuk, who introduced the Senate bill which eventually passed to become the current Justice for Victims of Corrupt Foreign Officials Act, said at the press conference that she made sure the legislation would apply globally and not just to Russia. That was exactly the vision of Cotler as well, whose motion passed unanimously in Parliament in 2015 supporting sanctions against any foreign nationals responsible for human rights violations, a move toward establishing a Magnitsky law. But having the legislation passed is just the beginning. The next step, says Andreychuk, is going after the human rights violators with the new law. “This is not the end of the bill. It is the start of the implementation,” she said. “China and the bill are an obvious fit,” he said. Given the large number of human rights violations in the world, Matas says it’s important to apply the law strategically. 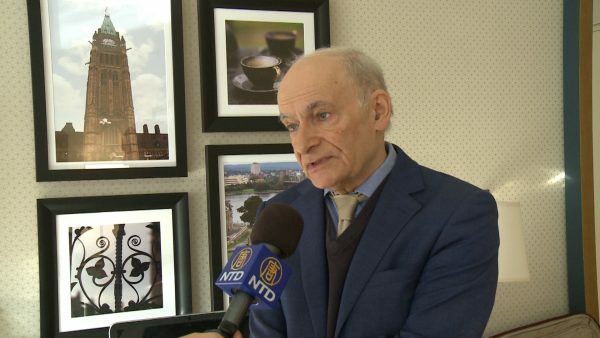 “I would think, in terms of priorities, go for the worst violators first, and go for the naming that will have the most difference,” he said, adding that a good place to start is with the ongoing persecution of adherents of the Falun Gong meditation practice in China. Falun Gong, or Falun Dafa, is a peaceful meditation discipline that has been severely persecuted by the Chinese communist regime since 1999. Matas cites some of the main perpetrators of the campaign of persecution against Falun Gong as examples of individuals who can be sanctioned under the legislation. That includes Jiang Zemin, the former leader of the Chinese Communist Party who started the persecution, and his proteges Luo Gan and Bo Xilai, Chinese officials who played major roles in the persecution and forced removal of organs from Falun Gong prisoners of conscience. Coincidentally, Bo, who is now serving a life sentence under current leader Xi Jinping’s anti-corruption crusade, had deep ties with notable figures in Canada’s business community. “It’s a way of preventing any Canadian connection to the human rights violations,” Matas said. Cotler says the fact that China is Canada’s second-largest trading partner shouldn’t make any difference in applying the legislation where it is warranted. “It’s not because they’re Chinese, it’s not because we’re targeting the Chinese government. We’re saying we don’t want the spillover of any cultures of corruption and criminality in any country which does not bring their violators to justice, to have it happen in Canada,” he said. Being concerned about the human rights situation in China is, in fact, being pro-Chinese, Cotler said. Conservative MP Rob Nicholson said he was happy to see the Magnitsky bill passed into law, as it was one of the bills he had his eye on right before the last federal election, when he served as the minister of foreign affairs. “It’s an important one—one more tool for Canada to crack down on those individuals involved with illegal activity,” he said. Nicholson said all countries should abide by internationally recognized human rights standards, and the Magnitsky Act applies to everyone. Conservative MP James Bezan said the bill adds another tool to the toolbox of the government to target corrupt foreign officials. “Whether it’s oligarchs in Russia, the Kremlin kleptocrats, or maybe it’s somebody in Ukraine, people that are harvesting organs from the Falun Gong in China, the Vietnamese communist government, or what we’re seeing right now in Myanmar … they should get the message that Canada will not tolerate these gross human rights violations,” he said.